Dragonfly Sweetnest: THE OOGIELOVES IN THE BIG BALLOON ADVENTURE! THE OOGIELOVES IN THE BIG BALLOON ADVENTURE! The summer's end is just around the corner and back-to-school season is heavily upon many of us. Before we get carried away with thoughts of pencils, books, and teachers' dirty looks why not treat your kids to a chance for one more adventure? Grab the kids for a visit to LovelyLoveville and join the Oogieloves on their journey to Schluufy's surprise birthday party! All your favorite characters will be there from Goobie, Zooie and Toofie to J. Edgar, Windy Window and Ruffy. This special celebration is not one to miss so mark your calendars because The Oogieloves in The BIG Balloon Adventure is coming to theaters on August 29th, 2012! The Oogieloves in The BIG Balloon Adventure was created to encourage interaction between the characters and the audience. It's a one-of-a-kind family musical that will have your children (and YOU) dancing and singing along in the aisles. It wouldn't be an adventure without some bumps along the way so come in with enthusiasm, creative thinking and be prepared to have a rocking good time! To get your families ready for the BIG balloon adventure, head on over to the official Oogieloves website to watch videos, learn some songs and explore LovelyLoveville. As parents, you might want to to check out the site to "Meet The Oogieloves" or download some printables for endless hours of fun! THE OOGIELOVES IN THE BIG BALLOON ADVENTURE is a simple story of a loving friendship, a surprise birthday party and a BIG adventure...It’s a beautiful day in Lovelyloveville. It’s Schluufy’s birthday and the Oogieloves (Goobie, Zoozie, and Toofie) along with their friends J. Edgar, Windy Window and Ruffy, are organizing a party (Ssshh! It’s a secret). Everything is going along just perfectly until J.Edgar trips and loses the last five magical balloons in all of Lovelyloveville - OH NO!!! 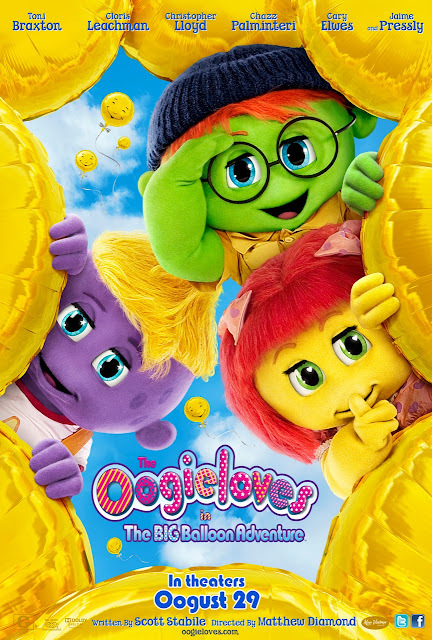 The Oogieloves immediately take action and set out to find the magical balloons in time to save their friend’s party. Along the way they meet some very interesting characters indeed, including Dotty Rounder (Cloris Leachman); Bobby Wobbly (Carey Elwes); Milky Marvin (Chazz Palminteri), Rosalie Rosebud (Toni Braxton) and Lola and Lero Sombero (Christopher Lloyd and Jaime Pressly). Can these new friends help them recover the magical balloons and get back to the cottage in time to celebrate Schluufy’s surprise birthday?